ICA 2018 | Thank you to all participants of the ICA 2018! After 5 days of congress it is time to say thank you! Thank you to over 100 volunteers who spent days, weeks and months making this congress as special and unique as it was. Thank you to all speakers presenting at the ICA! Thank you to 51 sponsors who helped to finance this great event! And of course a big thank you to over 2,700 participants who attended the ICA 2018 and made this congress an outstanding and successful event. 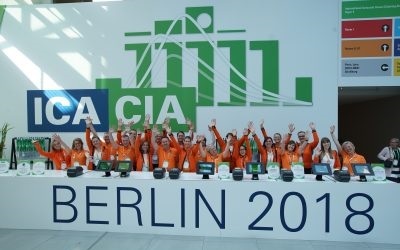 We hope you enjoyed your stay at the ICA and in Berlin as much as we did. It was a really exceptional experience and an honor to host this great event in Germany. Check out our video with the first impressions of the ICA 2018!